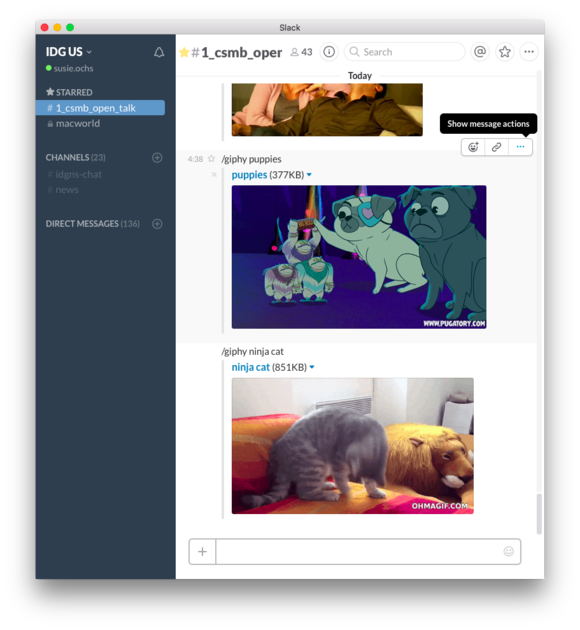 The chat app Slack can replace meetings, reduce email, and blend productivity with silly GIFs, all day long. It’s good to stay in touch. Today I work in my house all by myself, but even when I worked in the busy Macworld office, a large portion of our team didn’t. We stayed in touch by various, evolving means, first AOL Instant Messenger, then Campfire, then HipChat, now Slack. Slack is great. It’s indispensible. And it’s free. (The company gives it away with the expectation that companies will pay $80 or more per user per year to upgrade to their business-friendly edition once their employees become addicted to it.) If you haven’t tried it, you should. The Slack app on my Mac is currently logged in to eight different Slack communities, some of them quite active. If you don’t know what Slack is, here’s a primer: It’s essentially a set of private chat rooms or instant messages. You invite people to your Slack community, which can be accessed via the web or via a desktop or mobile app. There’s a “general” chat room, but you can also communicate one on one, in small groups, or create specific chat rooms for projects or topics. 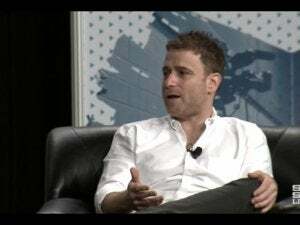 Slack becomes more than just a chat room through integrations, plug-ins that let you connect Slack to other services. Slack’s app directory is full of integrations that can make your Slack experience even more productive. Product-management plug-ins can write to a Slack chat room when work is done on a project; a scheduling bot can negotiate a meeting time among Slack participants and add it to a group calendar. If you’re working with people who aren’t physically present in your office, Slack can replace both meetings and the water cooler. One argument for physically housing workers together is because social interactions can help build a team, but for a generation that grew up communicating online, services like Slack are places for social interaction, and they do help build teams. I use the Google Drive and Dropbox integrations to tie my cloud documents directly into Slack. The paid version of Slack also supports email integration, so you can channel email directly into Slack groups where teams can directly act on those emails. The net result of using Slack, for me, is tighter bonds among coworkers, better communication across teams, and a dramatically reduced reliance on email and texting. Slack has rapidly become one of the apps I use the most. Then again, when I say Slack has become one of the apps I use the most, that’s a two-edged sword. Hanging around the water cooler is fun and builds camaraderie among your team members, but the boss gets angry if the workers stand around the water cooler too long. 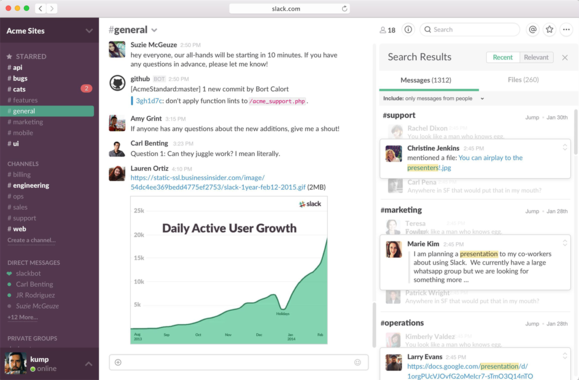 Slack can be a distraction and productivity killer, too. It would be wrong not to admit that. In Preferences: Advanced Options, choose “Hide any channels which have no unread activity unless they are starred.” This will dramatically clean up your channel list. You’ll still see any channels with new messages, or any channels you’ve forced to remain visible by starring them. It makes a huge difference. Snooze notifications by clicking the bell icon at the top of the sidebar. (It’s in the right-side menu if you’re on mobile.) Or just type /dnd and a length of time, like “/dnd 30 minutes”. If you need to get work done for a few minutes or hours, you can get Slack out of your way and focus. Every channel has its own notification preferences. Mute unruly channels—you’ll still be notified if someone in there mentions you—and turn off desktop and mobile notifications for all but the most important channels. Get to know the colon (:) syntax, which gives you access to plenty of emoji. Slack’s implementation of emoji is fantastic, and I use them all the time. Quickly add an emoji reaction to a post by typing the plus (+) symbol followed by an emoji, such as +:flag-gb:. And upload your own emoji by choosing Customize Slack and creating 128-by–128 images of whatever you want. Then you can do :skeletor: or :batman: or :dalek: and get the desired effect. On Slack for iOS, swipe right with two fingers to move to the Slack room you were previously in. 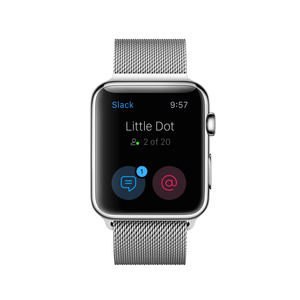 Swipe left or right with three fingers to switch from one Slack community to another. Install the Giphy integration and terrorize your friends and coworkers with GIFs on demand. Then open the Messages & Media preference and turn off the “Expand images and files uploaded to Slack” preference, so you never have to see them if you don’t want to. Or just type /collapse to make it all vanish.